State think tank Korea Development Institute (KDI) declared the economy was “slumping”, worsening from a “weakening” trend since November as all the data – industrial output, investment, consumption, and exports turned negative –, adding more pressure on the central bank to take a preemptive action to prevent the economy from falling into a recession. “The economy has sapped due to sluggish demand at home and abroad,” the think tank said in its monthly report for April. The KDI turned doubtful about the economy in November after it maintained recovery was in place until October. It raised the negative tone this month to raise alarm about a recession in the making. 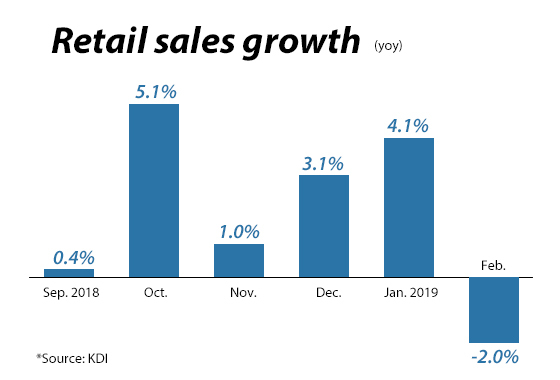 “Weakening cannot best describe the conditions in the economy,” said Kim Hyun-wook, a senior researcher for macro economy at KDI, pointing to the lengthy fall in capital investment and exports. The country’s exports dropped 8.2 percent in March compared to the same month last year, extending losing streak for the fourth month, amid dwindled shipments of semiconductors and reduced demand in China. Consumption was further hurt by worsening economic conditions. Growth in retail sales, a barometer of private consumption, shrank 2.0 percent on year in February and 1.1 percent in January to February excluding the effect of long Lunar New Year holidays, falling significantly below the last year’s average growth of 4.3 percent and fourth quarter’s 3.0 percent, the think tank added. The deterioration in the economy is adding pressures to the Bank of Korea on its policy direction to be announced on April 18, market analysts said. Although the central bank governor Lee Ju-yeol dismissed the possibility for an interest rate cut during a press conference last week, the market continues to bet on lowered rates. The benchmark three-year government bond has been yielding below the benchmark rate of 1.75 percent since late last month, and the five-year government bond yield is also moving closer to the policy rate.